Aboard the Spanish ship La Amistad, a group of enslaved people break free from their restraints and kill those aboard with the exception of two men. The freed slaves, led by Cinque (Djimon Hounsou), hope the two men will sail them back to Africa. However, the men steer the ship towards the United States, where it, and they, are recaptured by American sailors. Now, a trial must be held regarding what to do with the ship's cargo and to determine who, if anyone, has a right to owning this group of people. 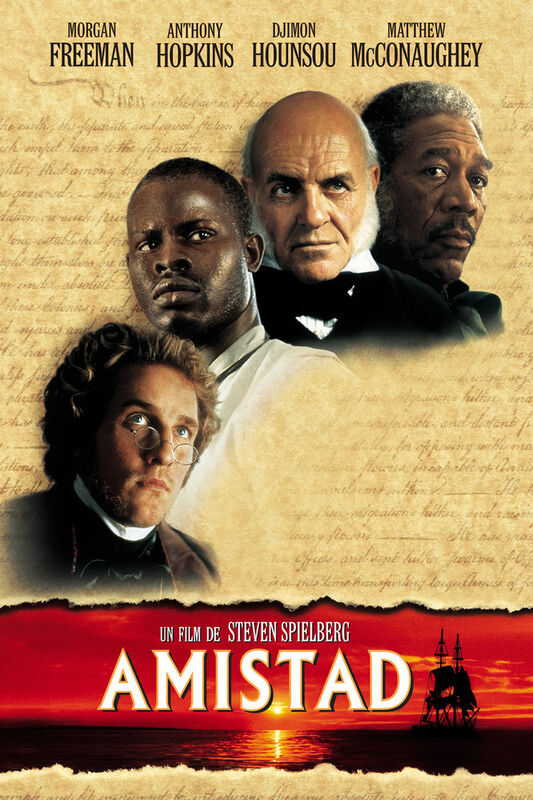 Steven Spielberg's "Amistad" is based on a true story and its corresponding court case. Of course, like most of Hollywood's true stories, some of the facts are fudged, including the case's historical significance in the American abolitionist movement. However, this doesn't necessarily stop it from being an entertaining or inspiring film. Spielberg is at his best when it comes to camerawork and imagery. After all, you don't get to being one of the best, most well known directors of all time for having shoddy camerawork. The film opens with a mutiny scene, which quickly and violently sets the intensity level very high early in the movie. Djimon Hounsou plays Cinque, a Mende tribesman who was captured from his home in West Africa and sold into slavery. He and many others were sold to a pair of Cuban traders who were transporting them aboard the Spanish ship La Amistad to Cuba. Cinque is the one who leads a group of slaves on an uprising, overtaking the ship and attempting to get it back to Africa. Unfortunately, the two men that were kept alive to steer the ship have sailed to the United States instead, where the slaves are immediately recaptured. A trial must be held about what to do with them, and their very freedom hangs in the balance. The ship eventually winds up in the hands of the United States government, and from there, the plot settles into a standard trial affair. The major players in the trial scene are Roger Sherman Baldwin, played by Matthew McConaughey, who is a property attorney speaking on the behalf of the enslaved Africans; prosecutor Holabird, played by Pete Postlethwaite, who is representing the government; and eventually, John Quincy Adams, played by Anthony Hopkins, who received an Oscar nomination for his portrayal of the former president turned lawyer. All of these men give relatively good performances, though the cast never fully comes together like we would have hoped. By far, Djimon Hounsou gives the best performance in the film. Hounsou was sadly overlooked during awards season. The amount of painstaking work he had to put into this film is visible from the second he appears on screen. He gives a truly stellar performance. The trial itself is almost always compelling as it is actually a property dispute. We appreciate the questions raised by this case, essentially boiling down to what defines a person, what defines property, and what it means to be free. Once the trial starts, the most impactful, heartbreaking moment is a flashback in which Cinque talks about his capture and enslavement, a practice that had been outlawed by the time the events in the movie take place. This whole section, showing the terrible conditions endured on the slave ship, is extremely difficult to watch. There are a few inspirational speeches and some emotionally grabbing moments towards the middle and end of it as well, though "Amistad" never really feels as moving and poignant as some of the other films of this caliber. Overall, this is a well acted and technically proficient film with an interesting, important subject that begs to be seen by history buffs and Spielberg aficionados alike. The way Spielberg plays with the light, adjusting it when needed to make his scenes the best they can be, is truly something spectacular. Unfortunately, though mostly gripping, it never picks up the pace and feels at least 45 minutes too long. One year ago, we were watching: "Jurassic World"